Can you remember the 4 strategies Marie shares to help you become indispensable in your industry? Don’t worry, we’ve got you covered! Download the summary sheet HERE. 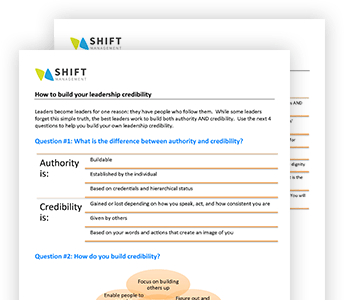 There are two major ways that all of us start to be seen as a “must have:” by having high authority, and by building high credibility. We earn our authority as we educate ourselves, gain credentials and build experience. In other words, authority is largely self-directed. Credibility, on the other hand, is conferred on us by others and it comes when we act with integrity, help others reach their goals, and treat others with respect ESPECIALLY when they may not deserve it.